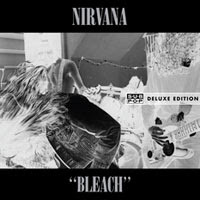 Even if you already have Bleach and have been listening to it for years (possibly 20 at this point), there's still some really compelling reasons to buy this new deluxe set, especially the vinyl version. First, the original album has been remastered. Maybe my ears are playing tricks on me, but I think you can really tell the difference. It makes you realize what a great job Endino did of recording the thing in the first place, especially given the limited time and resources. So the album itself sounds fantastic. Second, the packaging is sweet. I'm sure the CD comes with the same Bleach-era photobook insert, but in the LP version, it's nearly as big as the gatefold sleeve and almost seems like a coffee table book. Pretty sweet. Plus, it's pressed on white vinyl (like the original issue of the LP), and I was even lucky enough to get a copy with a few grayish streaks in it. And, you get a free download of the album that is a version recorded from the vinyl, which is sweet. You can actually hear them putting the needle down. Maybe that would be annoying for some, but I think it's pretty cool. And really: it sounds good. The third - and biggest - reason to get this thing is for the live set that's included. It's from 1990 at the Pine St. Theatre in Portland, and though it's short, the sound is incredibly good and the band plays a great set, filled with a nice assortment of songs. About half the songs are from Bleach, but they also toss in "Spank Thru," "Molly's Lips," "Dive," "Been A Son," and perhaps most random of all, "Sappy" (sometimes known as "Verse Chorus Verse"), which wouldn't see an official release until about four years later. It's a great little show, and though it's a tad sloppy, that just adds to the charm. It's great that such a quality recording from this era exists. 20 years later. Crazy that it's been that long.